This ecoregion occupies a very small part of southeastern Washington, extending into the state from northeastern Oregon, where it is much larger in extent. It is bordered on the north and west by the lower-elevation Columbia Plateau. The ecoregion is generally elevated and mountainous, reaching just over 6,000 feet in elevation, but not as high or steep as the neighboring Cascades and Rockies and the Wallowa Mountains adjacent in Oregon. There are gradual slopes in most areas, but the Grande Ronde and Snake rivers form substantial canyons with level plateaus above them. The topography has come about by the folding, faulting, and uplifting of early sedimentary and metamorphic rocks, overlain by deep layers of basalt from volcanic activity. This is a relatively dry ecoregion, with summers hot in the lower regions (reaching 90 degrees F regularly) and warm at higher elevations, and cold winters. The grassy foothills and low river bottoms are quite dry (rainfall less than 20 inches), but the mountains project sufficiently high into the westward winter air flow to capture more moisture. However, the air coming across the Oregon high plateaus is quite dry, so the higher elevations of the Blue Mountains are moist but not wet. Nevertheless, substantial snow blankets the mountains themselves each winter, and up to 20 inches or more falls in the lower areas. Rainfall is less seasonal than in those areas farther west more influenced by coastal airflows. Grassland prevails at lowest elevations, with bunchgrasses and scattered shrub thickets (e.g., roses, Oregon grape, and mock orange). With increased elevation, conifer forests dominate, first ponderosa pine and Douglas-fir and higher up subalpine fir and Engelmann spruce. Meadows are scattered through the forests, but the mountains are not high enough to reach treeline. Wetlands include only streams and rivers in this ecoregion, not of great significance to birds other than as a source of water. However, narrow bands of riparian woodland border the larger streams, and groves of quaking aspen fill moist depressions. This ecoregion is very sparsely settled by humans. Major impacts come from cattle grazing, mostly at lower elevations, and widespread logging on private and federal lands. As in other parts of the arid and semiarid West, the presence of introduced weedy herbaceous plants represents a threat to the natural landscape. Fire is an important component controlling succession in this ecoregion, and its suppression in recent years is changing the nature of the understory vegetation. 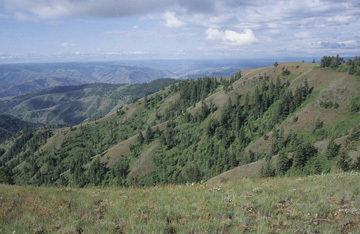 The core of the high Blue Mountains in both Washington and Oregon is protected in the Wenaha-Tucannon Wilderness Area.